One of the things I am always remiss in doing is providing access to what I have been writing that is beyond this blog. I was noticing that this blog does get a reasonable number of hits over the years. I feel that I should at least provide some direction for those searching for what the infamous P. David Marshall produces for others. I have been chastised recently for having an email signature that was just inordinately long - like a cv. Here is what that email signature looked like and it provides at least a suggestion of what not to do. What follows in this post and the next two is a guided tour to my writing. I hope this small gesture will help to reveal my own online persona with a little more sense! You can always go to my academia.edu site and hope that I have kept it up to date... Likewise, I have signed on to Research Gate. Unfortunately, with these locations it may not be possible to load everything. Copyright clearance sometimes gets in the way. Sometimes my lethargy in updating becomes another less-acknowledged but nonetheless real impediment. Another direction is my university's repository of research. It is called DRO and this is the link to what they have collected and verified as my research. Again it requires me to update. My Deakin profile is another starting point for investigating things as well. I also try - not perfectly - to update this online version of my CV. And of course, I flagrantly use Twitter to promote whatever I have finished recently. Those tweets represent my moments of pride. My Twitter handle is dmarshallmc and the name hearkens back to the days when we launched the journal M/C in 1998, one of the first online journals exploring media and culture and definitely the first that tried to traverse the worlds of popular culture and academically engaged research. It continues as a location for sophisticated public intellectual discourse of the highest order. In classic personal style I have buried my lead - I should be proclaiming what I have published most recently. What follows then is a little guided tour to my recent writing. And I really have had some absolutely sparkling moments. 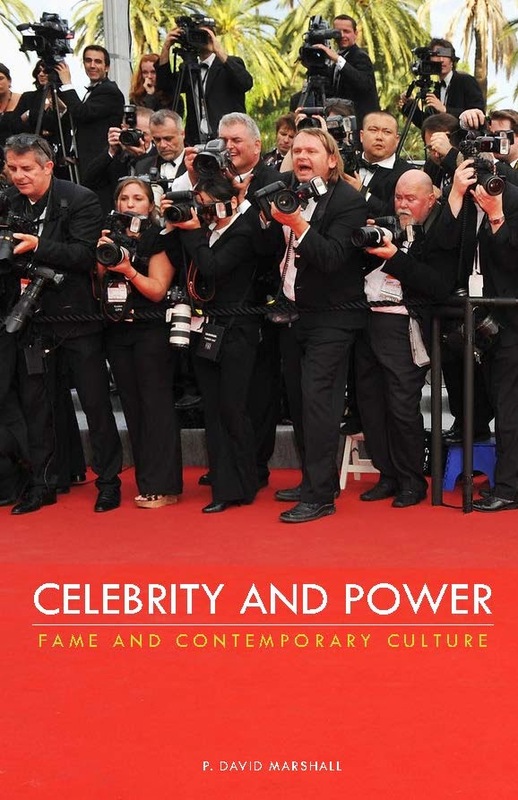 Marshall’s book offers a scholarly review of critical thinking about celebrity, an original attempt to theorise its function and significance, and a perceptive comment on current trends in contemporary culture. It is a thorough, intelligent and useful contribution to an important subject. Marshall deserves high praise for his skillful handling of the topic from the viewpoints of a wide variety of scholarly disciplines-sociology, political science, psychology, semiotics, linguistics, cinema studies, and cultural studies. My own publications in the issue included the co-authored (with my co-editors Kim Barbour and Chris Moore of course) introductory article "Persona to Persona Studies". It provides an interesting passage through the development of persona studies as well as a structured link to the research in the issue and related to persona itself. I also wrote what was called the feature article for the persona issue. Entitled "Seriality and Persona", I explore the value of the concept of seriality in understanding the constitution of the mask of identity that defines the idea of persona. From looking at fictional seriality - and using Tony Soprano (James Gandolfini in the The Sopranos), Frank Underwood (Kevin Spacey from House of Cards), and Eminem (Marshall Mathers) as key examples - the essay investigates the forms of projection and the structure of repetition that is part of the contemporary moment of constructing the public self. My research publications are very clearly thematically related. I am working very hard at building persona studies as a field of study and, both through my own work and those of my colleagues, it is growing quite rapidly. More publications will be appearing later in the year and I will work to update and post what is new. My next post will deal with my more popular articles that I have published recently. And there will be one further post in this series that will pass on some links to videos, presentations, and radio interviews that I have surfaced through various events and media through the past year. In all, this series will at least provide the material to know what I am up to on the research, writing and presentation fronts. Thank you! I like your blog, I read it often and find a lot of interesting for me. By the way, I am going to France next week. Hope my research paper which I ordered here https://academic-consultants.com/research-paper-writing/ will be done in few days. Great p David Marshall wonderful information sharing with us Send gifts to Karachi from UK .